1. Samuel Stone, b. 1 Oct 1656, Lexington, Middlesex Co., Mass. 4. JOHN STONE, b. 12 May 1663, Lexington, Middlesex Co., Mass. 5. Lydia Stone, b. 25 Nov 1665, Lexington, Middlesex Co., Mass. 6. 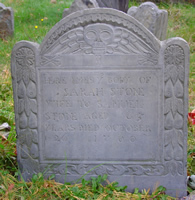 Mary Stone, b. 22 Feb 1668, Lexington, Middlesex Co., Mass. 7. JOSEPH STONE, b. 1671, Lexington, Middlesex Co., Mass. 8. Anna Stone, b. 30 Jun 1673, Lexington, Middlesex Co., Mass.